Modern Times is the 32nd studio album by American singer-songwriter Bob Dylan, released on August 29, 2006 by Columbia Records. The album was the third work (following Time Out of Mind and "Love And Theft") in a string of albums by Dylan that garnered wide acclaim from critics. It continued its predecessors' tendencies toward blues, rockabilly and pre-rock balladry, and was self-produced by Dylan under the pseudonym "Jack Frost". Despite the acclaim, the album sparked some debate over its uncredited use of choruses and arrangements from older songs, as well as many lyrical lines taken from the work of 19th-century poet Henry Timrod. Modern Times became the singer-songwriter's first No. 1 album in the U.S. since 1976's Desire. It was also his first album to debut at the summit of the Billboard 200, selling 191,933 copies in its first week. At age 65, Dylan became the oldest living person at the time to have an album enter the Billboard charts at No. 1. It also reached No. 1 in Canada, Australia, New Zealand, Ireland, Denmark, Norway and Switzerland, debuted No. 2 in Germany, Austria and Sweden. It reached No. 3 in the UK and the Netherlands, respectively, and had sold over 4 million copies worldwide. As with its two studio predecessors, the album's packaging features minimal credits and no lyric sheet. In the 2012 version of Rolling Stone magazine's list of "The 500 Greatest Albums of All Time", Modern Times was ranked at No. 204. The album was recorded with Dylan's touring band, including bassist Tony Garnier, drummer George G Receli, guitarists Stu Kimball and Denny Freeman, plus multi-instrumentalist Donnie Herron. Dylan produced the album under the name "Jack Frost". While it had been marketed as the third in a conceptual trilogy, beginning in 1997 with Time Out of Mind, Dylan himself rebuffed the notion. In an interview with Rolling Stone, he stated that he "would think more of Love and Theft as the beginning of a trilogy, if there's going to be a trilogy." Dylan's historical stature, as well as his renewed critical acclaim following Time Out of Mind and Love and Theft, helped to make Modern Times a highly anticipated release. As with Love and Theft in 2001, Sony held a listening event for critics far in advance, but those invited were forbidden from disclosing details or opinions about what they heard prior to the official release. Modern Times was leaked online through various BitTorrent and Dylan fan websites on August 21, 2006, after 30-second sound clips were released on the official Sony website. The album was first released in some European countries (including Germany and Ireland) on August 25, in the UK on August 28 and premiered in the U.S. on August 28 on XM Satellite Radio, the satellite radio service that carried Dylan's Theme Time Radio Hour program. Shortly after its release, the album sparked some debate in the media concerning its songwriting credits, mainly the liner notes' contention of "All songs written by Bob Dylan", which appears in most editions of Modern Times. Many of the album's songs have roots in well-known older compositions, though in all cases, Dylan has given the songs new lyrics. "Thunder on the Mountain" has a second verse based on the song "Ma Rainey" by Memphis Minnie. Dylan cuts and shuffles Memphis Minnie's lyrics substituting Alicia Keys and Hell's Kitchen for Ma Rainey and her Georgia birthplace. The reference to Keys was listed by Rolling Stone as among the "ten weirdest shoutouts" in song. The guitar licks and riffs are typical of Chuck Berry's famous records, with the melody sounding closest to "Let It Rock." "Rollin' and Tumblin'" is a blues standard first recorded and possibly written by the bluesman Hambone Willie Newbern. An arrangement very similar to Dylan's but with different lyrics was a hit for Muddy Waters, who is also credited with writing the song. Except for the first verse, all the lyrics in Dylan's version are original. "When the Deal Goes Down" is based on the melody of "Where the Blue of the Night (Meets the Gold of the Day)", a signature-song for Bing Crosby. "Someday Baby" is based on an old standard that can be traced back to "Worried Life Blues", recorded by Sleepy John Estes, and made famous in versions by Lightnin' Hopkins and Muddy Waters. It is sometimes referred to as "Trouble No More", and often credited to Muddy Waters. The chorus of "Workingman's Blues" features the line, "Meet me at the bottom, don't lag behind, bring me my boots and shoes." The unusual phrasing appears to have been borrowed from cool jazz singer June Christy's 1946 song "June's Blues", which contains the words, "Meet me in the bottom, bring me my boots and shoes". Dylan has shown an affinity for Christy's music, and played a number of her songs throughout the course of his Theme Time Radio Hour XM program. The line also appears as "Meet me in the bottom, bring me my running shoes", in the Willie Dixon song "Down in the Bottom" (itself an adaptation of "Rollin' and Tumblin' "), recorded by Howlin' Wolf. A similar variant appears in Big Joe Williams' song "Meet Me Around the Corner" ("Meet me around the corner, bring me my boots and shoes"). "Beyond the Horizon" is based around the song "Red Sails in the Sunset," written by Jimmy Kennedy and Hugh Williams in 1935 using its melody and basic structure. "Nettie Moore" takes its title, and some of its chorus, from an 1857 composition "Gentle Nettie Moore" by Marshall Pike and James Lord Pierpont, the composer of "Jingle Bells", though Dylan's melody and lyrics are otherwise unrecognizable, although the song shares a rhyme with "Moonshiner", a traditional folk song that Dylan recorded in 1963: "They say whiskey will kill ya, but I don't think it will" vs. "If whiskey don't kill me, I don't know what will." "The Levee's Gonna Break" is based on "When the Levee Breaks" by Kansas Joe McCoy and Memphis Minnie. It has been previously adapted by rock acts such as Led Zeppelin. The song has also been in the public domain since 2004. "Ain't Talkin'" derives its chorus from the more up-tempo "Highway of Regret" by The Stanley Brothers. The lyrics of the first verse seem to be derived from the first verse of "As I Roved Out", a traditional Irish song. Two other sources of the album's lyrics were cited in the latter half of 2006. In September, The New York Times ran an article exploring similarities between some of the lyrics in Modern Times and the work of 19th-century poet Henry Timrod. Albuquerque disc jockey Scott Warmuth is credited as the first to discover at least ten substantial lines and phrases that can be clearly traced to the Civil War poet across several songs. Dylan and Sony have declined to comment on the matter, and Timrod's name is nowhere to be found on the liner notes. Robert Polito of the Poetry Foundation wrote a detailed defense of Dylan's usage of old lines in creating new work, saying that calls of plagiarism confuse "art with a term paper". Fell considered the borrowings a homage and not plagiarism, noting Dylan's direct reference to Ovid in the album's first song, "Thunder on the Mountain", with the line "I've been sitting down and studying The Art of Love." The Art of Love was one of the great poet's most famous works. Well, you have to understand that I'm not a melodist... My songs are either based on old Protestant hymns or Carter Family songs or variations of the blues form. What happens is, I'll take a song I know and simply start playing it in my head. That's the way I meditate. A lot of people will look at a crack on the wall and meditate, or count sheep or angels or money or something, and it's a proven fact that it'll help them relax. I don't meditate on any of that stuff. I meditate on a song. I'll be playing Bob Nolan's "Tumbling Tumbleweeds," for instance, in my head constantly—while I'm driving a car or talking to a person or sitting around or whatever. People will think they are talking to me and I'm talking back, but I'm not. I'm listening to a song in my head. At a certain point, some words will change and I'll start writing a song. The lack of official credits is not a legal problem, given the age of the source material, but it troubled journalist Jim Fusilli of the Wall Street Journal. Fusilli thought that this was contrary to Dylan's long track record of noting his influences, as in the liner notes of 1993's World Gone Wrong. Joe Levy of Rolling Stone claimed to have raised the question with Sony BMG executives, who shrugged it off as a non-issue. Levy and many others have supported Dylan in the context of a larger, older blues and folk tradition of songwriters evolving old songs into new ones, which Dylan was no stranger to in the 1960s. Pete Seeger himself has previously expressed the view that Dylan is a link in this chain of folk and blues songwriters. Seeger has spoken many times about the folk process, often recounting that his friend Woody Guthrie once said to him "That guy stole that from me, but I steal from everybody". Ramblin' Jack at one time expressed similar sentiments: "Dylan learned from me the same way I learned from Woody. Woody didn't teach me. He just said, 'If you want to learn something, just steal it—that's the way I learned from Lead Belly'". Response to Modern Times from music critics was overwhelmingly positive. On Metacritic, a site that tracks prominent critical opinion, Modern Times holds a score of 89 out of 100, indicating "universal acclaim" and putting it among the 100 most acclaimed albums on the site. In a five-star review, Rolling Stone critic Joe Levy called the album Dylan's "third straight masterwork", while Uncut called it a "direct and audacious sequel" to Love and Theft. Robert Christgau of Blender described it as "startling [and radiating] the observant calm of old masters who have seen enough life to be ready for anything—Yeats, Matisse, Sonny Rollins". Jody Rosen of the online magazine Slate concurred, calling Modern Times "a better album than Time Out of Mind and even than the majestic Love and Theft, which by my lights makes it Dylan's finest since Blood on the Tracks". The album was also credited for original blues and folk rock music which was said to be "hard to hear these days" by critics. Alexis Petridis of The Guardian, while enjoying Modern Times, felt that it was "not one of those infrequent, unequivocally fantastic Dylan albums" and ridiculed the lavish praise heaped on the album, writing: "It's hard to hear the music of Modern Times over the inevitable standing ovation and the thuds of middle-aged critics swooning in awe." Jim DeRogatis of the Chicago Sun-Times appreciated the lyrical content but found fault in the languid music, writing that "with the exception of the closing track 'Ain't Talkin', one of the spookiest songs he's ever written, Dylan disappoints with... [his] inexplicable fondness for smarmy '30s and '40s balladry". Some reviewers who liked the album were critical of its musicianship, such as the Chicago Tribune's Greg Kot, as well as Jon Pareles of The New York Times, who wrote that "onstage Mr. Dylan's touring band regularly supercharges his songs. But on Modern Times the musicians play as if they’re just feeling their way into the tunes." Perhaps the sourest review came from Ron Rosenbaum. Writing in the New York Observer, Rosenbaum called Modern Times, "a wildly overhyped disappointment... The new album is possibly the worst since Self Portrait, with songs that rarely rise above the level of Dylan's low point—and everybody seems afraid to say so." 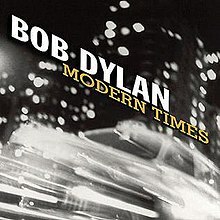 Modern Times became Dylan's third successive album to top The Village Voice's Pazz & Jop critics' poll, following Time Out of Mind and Love and Theft. The album also topped Rolling Stone's list of the 50 best albums of 2006, and was later ranked number eight on the magazine's list of the 100 greatest albums of the 2000s. At the 49th Annual Grammy Awards in 2007, Dylan won the Grammy Award for Best Contemporary Folk/Americana Album for Modern Times and the Grammy Award for Best Solo Rock Vocal Performance for the song "Someday Baby". Because of the length of the songs, the entire album stretched out to two LPs. The album's cover photo is Ted Croner's 1947 photograph Taxi, New York at Night. The image was previously used as a cover by the band Luna for their 1995 single "Hedgehog/23 Minutes in Brussels". The album was released in both standard and Limited Edition formats, with the special edition including a bonus DVD of four Dylan music videos. The DVD contains "Blood in My Eyes" (Promo Video), "Love Sick" (Live at the Grammys, 1998), "Things Have Changed" (Promo Video) and "Cold Irons Bound" (Masked and Anonymous Video). ^ NME, "Bob Dylan gets his first number one for 30 years", at NME.com; last accessed September 9, 2006. ^ Lethem, Jonathan (September 7, 2006). "The Genius of Bob Dylan". Rolling Stone. p. 6. Retrieved 2006-11-02. ^ "Ten Weirdest Shoutouts". Rolling Stone. July 9, 2007. Retrieved 2012-05-31. ^ "The Review by Ron Brown, published Sep. 21, 2006". Newreviewsite.com. 2006-09-21. Archived from the original on 2012-10-13. Retrieved 2012-05-31. ^ BobDylan.com page: "Theme Time Radio Hour – Seasons 1 & 2". ^ Rich, Motoko (September 14, 2006). "Who's This Guy Dylan Who's Borrowing Lines from Henry Timrod?". The New York Times. Retrieved 2009-05-11. ^ Vega, Suzanne (September 17, 2006). "The Ballad of Henry Timrod". The New York Times. Retrieved 2006-09-20. ^ "The Answer, My Friend, Is Borrowin' ... (3 Letters)". The New York Times. September 20, 2006. Retrieved 2006-09-20. ^ Polito, Robert. "Bob Dylan: Henry Timrod Revisited". Poetry Magazine. Poetry Foundation. Archived from the original on 2008-06-08. Retrieved 2009-05-11. ^ a b Fell, Cliff (October 7, 2006). "An Avid Follower of Ovid" (PDF). The Nelson Mail. Retrieved 2009-05-11. ^ a b c d Thomas, Richard F. (March 2007). "The Streets of Rome: The Classical Dylan" (PDF). 22 (1). Oral Tradition Journal: 35–36. Retrieved 2009-05-11. ^ "Talk Transcript: Another Look at Bob Dylan – Newsweek Entertainment – MSNBC.com". Web.archive.org. 2007-02-06. Archived from the original on 2007-02-06. Retrieved 2012-05-31. ^ LA Times article: "Rock's enigmatic poet opens a long-private door"
^ WNYC's Soundcheck, "Deconstructing Dylan," 6 September 2006, at WNYC.org Archived September 30, 2007, at the Wayback Machine; last accessed September 15, 2006. ^ "Reviews for Modern Times by Bob Dylan". Metacritic. Retrieved December 6, 2015. ^ Jurek, Thom. "Modern Times – Bob Dylan". AllMusic. Retrieved December 7, 2015. ^ Phipps, Keith (September 6, 2006). "Bob Dylan: Modern Times". The A.V. Club. Retrieved December 7, 2015. ^ Gilbert, Pat (August 28, 2006). "Modern Times". Entertainment Weekly. Archived from the original on September 1, 2006. Retrieved December 7, 2015. ^ a b Petridis, Alexis (August 25, 2006). "Bob Dylan, Modern Times". The Guardian. Retrieved December 7, 2015. ^ Harris, John (October 2006). "Justified and ancient". Mojo (155): 94. ^ Christgau, Robert (December 2006). "Consumer Guide". MSN Music. Retrieved December 7, 2015. ^ Petrusich, Amanda (August 29, 2006). "Bob Dylan: Modern Times". Pitchfork. Retrieved December 7, 2015. ^ Aizlewood, John (October 2006). "In The Pink". Q (243): 114. ^ a b Levy, Joe (August 14, 2006). "Modern Times". Rolling Stone. Retrieved December 7, 2015. ^ a b Hasted, Nick (September 2006). "Bob Dylan: Modern Times". Uncut (112): 72. ^ "Music High and Low Scores". Metacritic. Retrieved May 31, 2012. ^ Christgau, Robert (September 2006). "Still Blowin'". Blender (51). Retrieved June 1, 2016. ^ Rosen, Jody (August 30, 2006). "Bob Dylan's Make-Out Album". Slate. Retrieved September 9, 2006. ^ DeRogatis, Jim (August 27, 2006). "Dylan bringing it all back again". Chicago Sun-Times. Retrieved September 11, 2006. ^ Kot, Greg (August 27, 2006). "Wry, warm Dylan on 'Modern Times'". Chicago Tribune. Retrieved September 9, 2006. ^ Pareles, Jon (August 20, 2006). "The Pilgrim's Progress of Bob Dylan". The New York Times. Retrieved September 9, 2006. ^ "Modern Times". Warehouse Eyes. Retrieved 2012-05-31. ^ "The 2006 Pazz & Jop Critics Poll". The Village Voice. February 6, 2007. Retrieved June 1, 2016. ^ "Rolling Stone's Best Albums of '06". Stereogum. December 14, 2006. Retrieved May 31, 2012. ^ "100 Best Albums of the 2000s: Bob Dylan, 'Modern Times'". Rolling Stone. June 18, 2011. Retrieved May 31, 2012. ^ "GRAMMY.com". Web.archive.org. Archived from the original on January 6, 2011. Retrieved 2012-05-31. ^ Dansby, Andrew (May 1, 2009). "Bob Dylan's album covers sometimes just as powerful as his songs". Houston Chronicle. Retrieved 2009-05-12. ^ Goodman, Elizabeth (September 21, 2006). "Bob Dylan: Secret Luna Fan?". Rolling Stone. Archived from the original on 2008-04-06. Retrieved 2009-05-12. ^ a b c d e f g h i j k l m n o p q r "Bob Dylan: Modern Times". aCharts. Retrieved September 18, 2012. ^ "Canadian album certifications – Bob Dylan – Modern Times". Music Canada. ^ "Gold-/Platin-Datenbank (Bob Dylan; 'Modern Times')" (in German). Bundesverband Musikindustrie. ^ "Irish album certifications – Bob Dylan – Modern Times". Irish Recorded Music Association. ^ "The Official Swiss Charts and Music Community: Awards (Bob Dylan; 'Modern Times')". IFPI Switzerland. Hung Medien. ^ "British album certifications – Bob Dylan – Modern Times". British Phonographic Industry. Select albums in the Format field. Select Platinum in the Certification field. Type Modern Times in the "Search BPI Awards" field and then press Enter. ^ "American album certifications – Bob Dylan – Modern Times". Recording Industry Association of America. If necessary, click Advanced, then click Format, then select Album, then click SEARCH.